Awesome B&B accommodation in St Ives with spectacular views. A short walk to the beaches, Tate, coastal path and station. Choose one of our 6 rooms and enjoy fabulous breakfasts. There are no rooms available at Little Leaf Guest House for these dates. Attention to detail and little extras made all the difference. Fresh milk to have with tea, complimentary welcome wine, lovely toiletries in big and small sizes! Lovely breakfast with a "daily special" featuring something a bit different. magazines , local information and CD's available too. A really lovely 2 night stay. Lots of restaurants to suit all tastes an budget. Good shopping. Coast path is excellent fantastic from St Ives to Gurnards Head. We had a great time at Little Leaf Guest House. We stayed in Room 2 which has big windows with spectacular panoramic view onto the town, harbour and sea. The room was spacious, light and airy, had lovely toiletries and even a complimentary welcome wine in the room (lovely little touch!). We had all we needed in the room and even the hairdryer worked well (unlike in many other hotels we stayed in). One minor improvement would be to install a light above the bathroom mirror so it’s easier for contact lens wearers to get ready in the morning. Great location, only a few minutes walk to the centre of town, harbour and train station. Breakfast was excellent, with a different special option every day. Organic, freshly made, delicious food. The hosts were really lovely: friendly, helpful and professional. If we are in St Ives again (and I hope we will be soon) we wouldn’t stay anywhere else. We could see the hosts have put a lot of effort into making the place special, and it is! Thank you Anthony and Tim - what a little gem the Little Leaf is! An excellent Guest House, would certainly stay there again. A lovely b&b. Owners are very friendly and helpful. Just five minutes walk from the station and very easy to find. Also short distance to town centre. Room was very clean with tea and coffee making facilities (and nice biscuits) and compementary wine and water! Breakfast was excellent. As well as standard items such as full English there was a daily special. Would recommend staying here. Visit Hepworth Museum. Very interesting and the garden is an oasis of tranquility. The guided walk of the town is very interesting. Lovely couple, perfect hosts. Little Keira obviously has a future in opera! Room 2 was excellent, as was breakfast. The only downside was the uneven pathway along the terrace, a little hazardous for old knees. Sit on the 'Friendship' bench outside what is now Café Pasta and watch the harbour with a coffee. Lunch at the Porthmeor Beach Café and marvel at the surfers. Laze on Porthminster Beach with an ice cream and look out at Godrevy lighthouse. Dinner at the Mermaid Bistro in Fish Street and enjoy Matthew and his team's banter. Absolutely everything about Little Leaf was excellent. We didn't get to meet Tim but Anthony was a treasure, welcoming, helpful, attentive .. nothing was too much trouble. We would highly recommend Little Leaf and hope to return very soon. A lovely place to stay, very convenient for the railway station, and with a superb view. The room was comfortable and clean - next time hope to stay in one with the view too. Breakfasts were fabulous. Excellent variety of breakfast choices. Host extremely helpful with local information. Close to bus and train stations. Ask for room #2 for lovely bay window and view. Charming, quiet neighborhood. Take bus A3 to Lands End and ride on upper level. You will see the entire coastal region along twisting narrow road thru lush farms and right thru people's back yards. Bypass the lower beach and shops and go to The Island thru the older area of St. Ives using the extremely narrow alleys and back walkways. Excellent location, very central with great views also quiet and peaceful. Extremely helpful , pleasant owners who generously share a wealth of local advice and knowledge . Excellent local restaurants. There is very helpful book of reviews from fellow travellers. Great stay, thanks for everything. The coast walks are great. We stayed in the room with the wonderful view from a bay window, overlooking the harbor and the town of St. Ives. The room was wonderful, the breakfasts were outstanding, and Antony was a superb host. A five minute walk puts you in the downtown district, with lots of shops, restaurants, galleries, and harborside activities. There is an area called The Island that is a great walking area, excellent views. Anthony and Tim were perfect hosts, so welcoming and helpful. We relied on Anthony's extensive local knowledge for tips on getting around! The breakfast was great every single day and the room was brilliant. Definitely go to The Firehouse for dinner and to Carbis Bay Hotel for lunch in their conservatory. We both really enjoyed our stay with you. Your warm welcome and hospitality will stay with us for a long time. Every morning there was a delicious breakfast, ensuring we were "set up for the day" before deciding where we wanted to go. Our room was beautiful - neither of us have ever stayed in a room with such a beautiful view of the sea and harbour. We ate at Sea Food Cafe one night and twice at Back street Bistro in the evenings. One day we had a lunch of pasties (one traditional and one vegetarian) from the Yellow Canary Cafe. The Barbara Hepworth museum and garden is truly stunning. The beaches are beautiful. There are so many amazing galleries and art-studios to see. Very friendly hosts, great location, great breakfast - highly recommended! Everything was excellent. The rooms, the food. Absolutely nothing to fault. Many thanks Anthony and Tim for help in making our stay in st Ives so relaxed and enjoyable. Very fine rooms, most lovely hosts, wonderful breakfasts and a beautiful location make for the perfect getaway! Very well recommended! We had an excellent stay, lovely rooms, delicious breakfast and great hospitality - all a few minutes' walk from the centre of St Ives. The complimentary wine was a first! Would definitely stay again. The Back Street Bistro for dinner was another great find. Local buses great. Curry Garden restaurant very good. Excellent service, hospitality! The room 5 has amazing sea views! Will definitely come back again! Thank you! Perfect stay for a friends wedding weekend. Close to central St Ives, including the pre-wedding bar, the wedding location hotel, the shops, the harbour, beaches etc Antony and Tim were consummate hosts, ensuring we had everything we needed over our three day stay, including extensive breakfast options in house and dining recommendations around town. Fantastic location, especially the rooms with a view, very friendly welcome by the host, delicious breakfast - highly recommended! Fantastic little guest house with outstanding facilities. Our room had beautiful view of the sea and the hospitality was exceptional. Well recommended we will return again one day. Only 4 minute walk to sea front with plenty to see and do. Lovely stay at Little leaf,Comfortable and very friendly. Hosts make you very welcome and looked after.Very good quality breakfast cooked to perfection.Only wish my stay had been longer. Numerous great restaurants and Bars. For walkers the St ives to Zennor walk is spectacular but strenuous particularly the climb out of town,but does level out and you are rewarded with fantastic coastal scenery. Less energectic but beautiful is the shorter walk to Carbis Bay and a drink at the Carbis Bay Hotel. A warm welcome, the best breakfast omelette and high standards of comfort and cleanliness. Highly recommended. Really enjoyed our stay in room 2. The only minor detail we would change is to have the fan in the bathroom shut off when the light is turned off. Also would be good to have somewhere to type on a laptop in the room - even a little collapsible "TV tray" would work. Otherwise, excellent! The attention to detail is obvious and much appreciated. The Scott Troff cafe has really good salads and soup - we ended up having lunch there twice because the salads were so good and healthy (an antidote to all of the fried food and pasties :)). Plus they have the cutest little dog ever sitting in a basket keeping guard over the customers. Also, can't beat the location of the Porthmeor cafe. Less than excited about the Tate - lovely building but content just not our cup of tea. Just a comment, not a tip: we've never been anywhere that has so many dogs - as dog-lovers, we really enjoyed this and are envious of how dogs are welcomed in so many places, unlike at our home. Tim & Antony could not have been better hosts, very attentive and pleasant. Marvelous views from the house. Lots to see and do in the town and surrounds. 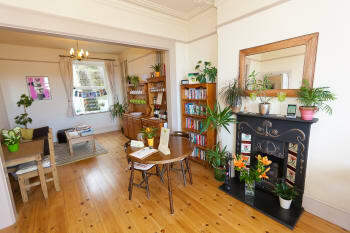 Lovely hosts, comfortable room and delicious breakfasts - excellent B&B experience. An absolutely superb guest house! I was made so welcome by Anthony and Tim. I stayed in Room 4 which was lovely. Lots of little touches including a complimentary mini bottle of wine. The choice of decor was stylish and contemporary , suiting the building perfectly. The breakfast was fab. I loved it at Little Leaf! This would be my first choice if I visit St Ives again. Thank you Anthony & Tim. Thank you for a wonderful stay. All of the little touches make for a real special place to stay. Friendly and well located, very comfortable bed and a great breakfast . Highly recommended . The service was absolutely second to none. We had an absolutely brilliant stay and would definitely recommend comend to others. Cannot be faulted re hospitality/service and quality breakfast Highly recommended! Excellent stay. Antony and Tim were great hosts, good company and never short of advice on things to see and do . Breakfasts were faultless. The location offered the rare combination of a great view and quick, easy access to the town. I enjoyed my stay at Little Leaf Guest House. The hosts are lovely people and the breakfast was excellent. Guests could chose from an extensive menu i.e. "Full English" etc. or have a "daily special" which varied each day and were deliciously different. What great hosts Antony & Tim were. Very welcoming, made you feel at home. Great room very comfortable clean & bright. Loads of choice for breakfast from a large full English, cereal a different special everyday, but my daughters favourite was the superb waffles. We were warmly greeted by the owners who showed us to our room. Our bedroom was room 3 up a couple of flights of stairs, the room had everything we needed for our stay. Breakfast was great, there is a daily special, Our breakfast was cooked to perfection and thoroughly enjoyable. The guest house has amazing views to the front of St Ives harbour. Wish we could have stayed longer! There are many places to dine in St Ives, We would recommend the Fire House Steak and Grill. Its quite modern and you may need to book in the evenings. Its also a gin drinkers paradise! very friendly, helpful and hard working hosts, spotlessly clean, and updated house on a hill with great views of st ives bay. Good breakfasts with a variety of options for all. the garden room looked like a wonderful retreat also. A lovely comfortable home from home, our room was clean and modern. Very relaxed atmosphere. Anthony and Tim were very friendly and welcoming. I would definitely stay here again. Met some nice people in the Sloop Inn and the food was good. Also had a nice Indian in the one up the hill (forget the name). Saw some great scenery, Kynance cove particulary and Sennan cove was great for the waves. Clovelly, although a bit of a way from St Ives, was definitely worth a trip. Such a lovely B and B! Stayed in room 4 which was small but very cosy and had everything we needed. Antony was a very attentive and helpful host and the breakfasts were delicious. We will definitely be back to stay at Little Leaf. Excellent guest house, very friendly and efficient. Made me feel welcome from start to finish. Enjoyed the variety of breakfasts and the help-yourself tea/coffee/milk facility as well. Highly recommended. A truly brilliant place to stay. Everything was perfect! Thank you so much to Anthony and Tim. Fabulous location, attention to detail superb throughout. Really superb breakfast. Recommend the Black Horse on Market Place. Anthony and Tim really go out of their ways to make you feel at home at the Little Leaf. The room was tidy and comfortable. Breakfasts were simply delicious. Any time again! From the moment we arrived Anthony couldn't do enough to make us welcome. Nothing was too much trouble. The rooms were spotless and the public areas were just the same. Breakfast was lovely and fresh as it is made to order. St Ives is quite hilly so beware if you are pushing a trolley or a wheelchair. Getting into town early would be to your advantage as there are only a few parking spaces in the harbour area, however you can park in the leisure centre car park and there is a bus which runs regularly into the town which is a short ride away. Fabulous views, very comfortable and warm welcome. Breakfast delicious. Blas Burgers in the Warren. Really enjoyed our stay. Can recommend the very well cooked and varied breakfasts and Anthony was very helpful and knowledgeable about the area. All in all a brilliant holiday! Fantastic guest house amazing breakfast Antony was so friendly and helpful , I also love the nice touch of white company bath products . The place is very nice and located at the place where easy to walk to town. The owners are very helpful and kindness. Excellent weeks stay at little leaf.brillant breakfasts comfy room with a great view.returning again next year. The seafood restaurant - excellent steak! Tex mex - large portions great food Firehouse - lovely meal great view if u get a window table. Raj poot - excellent curry. Had a wonderful stay. Great room with everything we needed and more. Breakfast was the best we've had anywhere. Sadly didn't meet Tim but Anthony was a perfect host. The Little Leafe Guest House in St. Ives was the best B&B we stayed in during our Holidays in August 2016. Anthony and Tim gave us a very warm welcome and we felt "at home" immediately. 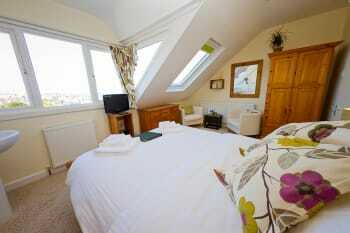 Our room was very cosy, clean and had a stunning view of St. Ives Harbour! Anthony gave us good hints for our walks at the Lands Ende. Try the absolutely delicious waffles!! There is always a warm welcome at Little Leaf and Antony and Tim are clearly concerned that every guest has a comfortable and enjoyable stay. Excellent tasty and generous amounts of food, amiable and professional service and a warm, relaxed atmosphere. Fantastic location above the hustle and bustle but a three minute walk into the heart of St Ives. Highly recommended. Antony and Tim are the most wonderful hosts. We were made to feel so welcome and comfortable in every way. Tim's breakfasts are fantastic. Their position is central to the town centre and with wonderful views. Explore the town and its many galleries. Visit Minack Theatre and St Michaels Mount. Great location, great hosts, great breakfast quality and choices, great rooms and excellent value for money. Go to Peppers for a good quality and value meal, also try Cellar Bistro. We would recommend the Firehouse restaurant as we found it to be excellent value. We had a lovely stay here and would certainly stay again and will recommend you too. Lovely and clean rooms; very tasty breakfast and friendly and welcoming hosts - we can't fault it and a big thank you again. Try the cinnamon French toast for breakfast if its on offer as a daily special - yum! We ate in the Cellar Bistro in town - good food and service. Go Kayaking - its great fun if the weather is nice. We can recommend both The Badger Inn in Lelant and The Inn and Lodge, Balnoon for meals. Falmouth is a good shopping town as well as St Ives itself. Tim & Antony was a great host making you feel very welcome,the room was very clean & comfortable with little extras having available fresh milk to make a drink in your room,bottles of water & wine in your room complimentary was very welcome after a long drive. Breakfast was first class full English was very tasty and also serving a special each day was a nice touch. I have stayed in many places across the country (Hotels & B&B's) but I have to say this has been without question the most accommodating. But then don't take my word for it - try it for yourselves you wont be disappointed.. This lovely family will stop at nothing in making sure your stay is warm and welcoming. Oh and make sure you try the Sausages. 1. The car park near by is limited for space and gets busy quite early, but in fairness that's the same all over St Ives, that said at £7.50 for 24 hours its not a bad rate. Anthony and Tim very helpful nothing was to much trouble. St Ives a fantastic place to visit. Had s very nice meal at the Bean Restaurant. We had such a lovely stay here at Little Leaf. Antony & Tim were great hosts. The food was superb. The accommodation and location were great. We will definitely be back and would highly recommend Little Leaf to everyone. St Ives and the surrounding area has so much to offer. Thank you Antony & Tim for a lovely holiday. Very friendly and helpful. My room was very clean and had everything I could need. The complimentary wine was much appreciated after my long journey. The breakfasts were delicious..especially the perfect poached eggs! I had a wonderful stay..thank you! Lovely B&B. Anthony was very Nice, helpful and serviceminded. Very good breakfest. Couldn't be more helpful and made sure they were always available if required either in person or on the phone. If you haven't been to St Ives before do remember there are many steps and uphill routes you will encounter. We found the Cellar Bistro to be excellent with a great atmosphere and attentive staff. We had an amazing stay at your beautiful guest house. Thank you so much for your hospitality and for all the good tips for restaurants and things to do in St Ives. We want to return as soon as possible! We can recommend all of these three restaurants: - Alba - The Loft - Cellar Bistro (the one we enjoyed the most) For good drinks/cocktails we recommend the Hub. Can also recommend having lunch and a beer at Lifeboat Inn. And, when in St Ives, one is obligated to visit the oldest pub, the Sloop (dated back to 1312). Other things to do: Enjoy the nice, cozy shops in the old town and walk the coast path (AMAZING!). Warm welcome, local knowledge and map loans all appreciated. Accomodation more spacious than most. Superior quality breakfast, particularly the daily specials. SO HAPPY to have chosen to stay here - wonderful few days and such great people looking after us. Nothing too much trouble, great breakfasts, everything clean etc. I can't recommend highly enough! We stayed in the garden room, which comes with its own terrace and garden at the back. A lovely private hideaway. The rooms at the front would equally have wonderful views over the town. AMAZING! Best vegan and non vegan breakfast I have ever had! Staff is lovely and welcoming. Would love to come back and stay for a bit longer. Lovely friendly, helpful owners! Breakfast was outstanding! Highly recommended! We were received to a very friendly and warm welcome after a long drive which set the scene for a great stay. The owners were very hospitable and suggested things to see and do. The small room we were in was not as small as we imagined which was a bonus. The room was very light and tidy. Breakfast was delicious with a changing menu each day. Note down the mobile numbers of all the boat sight seeing tours on the harbour front. Drop a text to each number in the early evening (rather than the peak of the day time) and you'll get a few replies from the skips. St Ives can get a bit hectic within the small streets, so take a walk along the coast to the next couple towns/villages and catch the train back. Antony and Tim are very nice and friendly hosts. Breakfast was delicious, especially the omelette. We got good advices where to go or what to do. If we come back to St Ives this will be the place to stay again. Another fantastic stay here. Anthony and Tim were welcoming as always and the breakfast was every bit as delicious as I remember!! We had a great stay. The room as of the rest of the house was spotlessly clean. Tim and his wife were extremely friendly and made us feel at home. The breakfast wow that's a big breakfast, with many choices. The view was amazing which indicates a bit of s climb but so worth it. Would definitely recommend. Thank you. This is my 3rd trip to Little Leaf and as usual Anthony and Tim were excellent hosts. Nothing is ever to much for them. The location is excellent with beautiful views over the town and harbour. I'm already planning my next trip back. Lovely, friendly owners, very helpful. Really well organised and run a great b&b. Recommend room 2, wonderful view. Herzliche Begrüßung mit Kaffee und Tipps. Liebevoll eingerichtet und leckeres Frühstück. Wonderful stay. From the moment Anthony and Tim met us with cups of tea and coffee at check in we were treated to an excellent visit. Our room was well appointed with a great view over the town and harbour. Tim prepared outstanding and original breakfasts. Location is a quick and convenient walk into the tow's center. Overall a warm and welcoming experience. We can't wait to return. They were very friendly and helpful. Breakfast was really good. The location of the house is nice because of the wonderful view over the town. We really recommend everyone to stay there. Tip: olives cafe in the old district. Galleries and nice shops. Very friendly and welcoming. Breakfasts were amazing. The simple frontage belies the sheer quality that lies inside the Little Leaf Guest House. 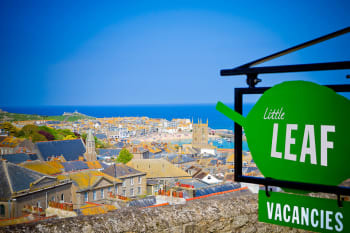 Located away from the town centre and off the main drag, the Little Leaf is set in a quiet location, with a perfect view of St Ives from the front. A warm and friendly welcome was extended from the very moment we arrived. Our most comfortable room was spotlessly maintained, and furnished / equipped to a very high standard. Of equally high standard were the breakfasts - oh how I wish I could poach eggs so perfectly. Plenty of information was available on things to see and do, with an updated card file of local restaurants kept handy. Parking in the nearby Pay & Display Car Park, but charges are reasonable and we didn't have any trouble finding a space (in early May). Highly recommended. The Little Leaf WILL be our first call for accommodation, should we visit St. Ives again. Good beaches. Plenty of local, independent shops, with a wealth of good quality arts & crafts, alongside the usual seaside and surfing fare, which although present doesn not dominate the town. Plenty of good places to eat, with a good range of quality fare on offer. St. Ives is about 50 miles / 1 hour's drive from the Eden Project. Very welcoming. Amazing breakfasts. Comfortable room. Good location with nice views. Close to train station and easy access to town and beaches. Definitely recommend little leaf to others. All at the highest level. Location with a great view of the harbor. Rooms clean, breakfasts big and very tasty. The owners were very nice and helpful.We would defentely like to come back there. Best regards to Anthony & Tim. Antony & Tim are excellent hosts, they are very welcoming & are very accommodating. 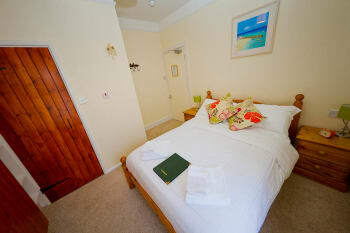 The rooms are very clean & comfortable, as well as the communal areas. Breakfast was delicious! We chose the full English both mornings but there are plenty of other options. 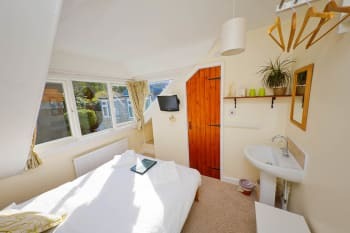 The guest house is very close to the centre on St Ives, but there are quite steep steps and a steep hill down to the town. Cream tea at the a Tea Room & Madelines Tea Room - both delicious. The Hub for great American/BBQ food, but massive portions! Clean and comfortable with lots of sweet little touches to make for a lovely stay. Great location and beautiful view! Cellar Bistro was excellent. Walk from Zennor to St Ives. Bit of a climb to get there, but worth it for the stunning views of St Ives. Very friendly couple running the B&B. Beautiful coast path to both directions. Our hosts were very friendly and helpful. They provided a lovely breakfast each morning, with good choices. The specials changed each day and were very tasty. The room was very comfortable with amazing views. We would definitely recommend Little leaf guest house. We will look forward to returning again soon. The beaches are lovely and the coastal path is beautiful. Some good places to eat Porthmeore cafe is excellent. Great cafe near the breakwater. Interesting galleries. Barbara Hepworth is a must see! I was made to feel very welcome by Antony, this is a super guest house, very clean and bright with lovely views. Facilities in room were great, lovely toiletries and tea/coffee and even some wine. I would certainly recommend and I will be staying here again. Beautiful place, lovely rooms! Will definately be returning! Another fabulous weekend in St Ives at Little Leaf. Fantastic location with a view that means the steps up from the town are worth it. Very welcoming, great food and a lovely house. We stayed in Room 2 - lovely big room with stunning views over the town, harbour and Island. We ate at The Black Rock and Cellar Bistro restaurants - both stunningly good. Gorgeous food and great friendly service. Perfect room, food and hosts. Highly recommended. We were very very impressed with St Andrew's Street Bistro, and would definitely recommend it to others as a wonderful place to eat of an evening. We had a great time and were pleased with everything. Highly recommended! Lovely B&B with welcoming, helpful staff and delicious gluten free breakfast. lovely place to stay and very good breackfast! The houseowener is very friendly and hospitable and gave us good recommendations for restaurant and tours in the region. Beautiful hikes along the coast. We had a fantastic stay and nothing was too much trouble for Anthony & Tim. Highly recommended! Really enjoyable stay. Can't wait to return! St Ives speaks for itself! Beautiful area, great food & locals very welcoming. Lovely guest house. Received a very warm welcome from Antony on arrival and experienced nothing other a first class stay with some lovely touches that sets Little Leaf apart from many other guest houses we have stayed at. The breakfast was fantastic and didn't need to eat another thing until the evening! Will definitely be our first choice when we return to St ives. The Mex restaurant in town was very good (as recommended by Antony). A visit to the Minack Theatre is a must, you will not see better scenery where a beautiful aqua sea meets the golden sand in the uk. Our stay with you was all too short. Room 2 was everything we could have wished for. The bed was very comfortable and the en suite immaculate. The view from the room was fantastic despite the unfortunate weather. Antony and Tim are excellent hosts, very friendly and welcoming and the cooked breakfast was one of the best we have had in a B and B. We could not be more complimentary. Excellent value for money and we will be back. The Lifeboat Inn was fantastic. The quality of food was outstanding and the service very good. The Barbara Hepworth museum was very interesting and the sculptures are wonderful, beautifully displayed in the garden. Excellent breakfast,liked having a daily special choice on the menu.Hosts were friendly and welcoming. Complimentary items and high standards throughout,made our stay a happy one . Thank you. A lovely overnight stay in St. Ives! Staying at your B&B was a highlight for me during my recent trip to the UK. My room on the top floor was excellent - so comfortable and spacious with such a wonderful view of the town and bay - and the breakfasts were a treat too. You made me feel very much at home with your warm welcome. I'd recommend that anyone visiting St Ives should try to stay at Little Leaf. Thank you so much! I was really glad to have gone on a half day tour run by a local operator, Russ. He decides the itinerary on the day depending on the interests of those on the tour and it meant I was able to visit many places I would not have got to otherwise. He is very relaxed, friendly and knowledgable with an obvious passion for the local area and its history. Strongly recommended. The walking trail to Cardis Bay is a must.watching the lifeboat training with the new tractor and boat fascinated me. The hiistory museum is very well presented. I spent 2 hrs there. watching the tide empty the bay is an amazing site, as it seems to happen fast. We took a tour with Russ Peaks from Western cornwall tours. He is a fine guide. His van takes 8, and also does private tours. I went 2 days! The village is full of good eating. We had a really pleasant stay. Anthony makes you feel at home. Breakfast is excellent. Rooms are really comfy, come with everything you need. Ask Anthony - he knows best and can give you detailed tips. The host is very friendly and help us to know the Village and the people who live here. We are reccomending you to our friends. Beach Restaurant and Seafood. Lovely. My husband and I stayed here 2 weeks ago and thought it was beautiful. We stayed in room 5 at the top. The views were amazing and our room was a good size. Comfy bed and lovely and clean. The breakfasts each morning were cooked for us and were yummy. Anthony was so helpful with advice on where to visit and how to get there. Recommend to anyone wanting to stay in St Ives. Fantastic little B & B, extremely friendly hosts, great selection at breakfast and lovely clean room, would definitely recommend to others. great stay there, the 2 owners were really nice and helpful. Breakfast is amazing (the view from the room and the food!). The location is perfect to visit st ives and the area. There is a car park just 1 min away which is very handy. Very hospitable, very welcoming, very clean and comfortable and excellent breakfasts. Will definitely be returning next year. In September when the festival in on lots of entertainment is free and really good in Norfolk Square. The local church gave really good musical events. Friendly, informative and helpful, with quality facilities and fabulous breakfasts. Don't miss the Minack Theatre! Reizende hilfsbereite Gastgeber und sehr aufmerksam. Tolles Frühstück mit Specials. Toller Blick vom Haus aus. Unser Zimmer leider ohne Aussicht, aber ruhig. Very friendly and welcoming, we felt comfortable and well looked after. Perfect for what we needed. We had a lovely dinner at Porthmear café - ask for one of the alcoves to get a view of the beach and hear the waves while you eat. Lovely food and friendly owner. Very clean and a great location. Would definitely stay again. The cornish deli does some lovely food. 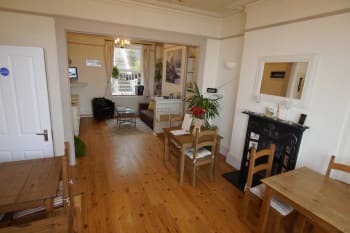 Extremely welcoming and would highly recommend a stay at Little Leaf Guesthouse when visiting St Ives. Outstanding breakfasts with a lot of choice and delicious specials. Lots of information provided for things to do etc. A wonderful stay with great breakfasts and lovely service. Thanks! The sea food resturant next to the sloop inn is fab & also the sloop inn is a must. Lovely b&b. It's not often you stay in a place where everything is spot on, but the rooms were clean and well-presented with good attention to detail (everything you might need was there), the hosts were incredibly welcoming and the breakfasts delicious (and of generous proportions). Rooms vary in terms of spaciousness but all have character and their individual qualities are well described online with images, allowing you to make the right choice for your stay, and they are priced accordingly and, we thought, accurately to reflect what you are getting for your money. (Sometimes you can stay somewhere very nice but feel you are paying through the nose for the privilege: not the case here, it was priced just right.) Ten out of ten. There are so many cafes and restaurants in St Ives now, you are spoilt for choice. Spinachios was a gem - no airs and graces just really good, locally-grown produce, provided you like your veggies. Lovely coastal walks either direction. Tate St Ives, Barbara Hepworth Museum and Bernard Leach Studio and Museum a must if you are an art-lover, plus plenty of studios and galleries to browse around - St Ives Contemporary Ceramics and Penwith Gallery a couple of the best now that Wills Lane Gallery has sadly closed. Newly named Art Gallery and Penlee House just down the road, plus closed down. Sculpture Gardens if it's a nice day. Farmer's market weekly(?) in the Guildhall Good for food/gifts. Nice little cinema on a rainy day. Lots of lovely beaches at St Ives and beyond... Lost Gardens of Heligon, Eden Project and various heritage places around and about. List is endless! Great. Everything was just great. Excellent breakfast too. All very nice - the views from our room were wonderful. We got a very warm welcome. The breakfast was amazing, we rank it to be one of the best during our UK trip. The recomanded restaurants and tour tipps have been Perfect. Thanks a lot. Brilliant stay,had a great week,lovely views from room two.Antony & Tim very helpful and accommodating.A very nice breakfast every morning.A great b&b with a lovely couple passionate about their business. 57 fore St is a lovely tapas restaurant. Alba restaurant great meal,lovely with a harbour view. Seafood restaurant very nice meal. Thanks to our gracious hosts, Antony and Tim, we have had a most wonderful stay in lovely St.Ives. It was just perfect. We'll be back! Excellent breakfasts; we we're always very excited to see what the daily special was going to be. Cinnamon french toast with cream cheese and berries was outstanding. Enjoyed having proper coffee too. Very friendly and welcoming. Sea Food Cafe is very good and does an excellent crème brûlée. Wafflelicious waffles are delicious but VERY large - be warned. You couldn't have done anything more to ensure our stay was comfortable and enjoyable. Breakfast was amazing every day, and fantastic local knowledge on recommendations for places to eat/see/do. Perfect, thank you! Very nice B&B at a very good location in St. Ives. Very good breakfast and lovely hosts. 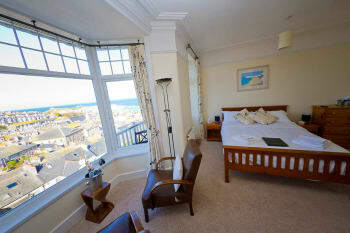 The view of St. Ives is also perfect from this B&B especially from room Nr. 2 and from the breakfast room. Downtown St. Ives is less than 5 minutes (walking). Parking in front of the house is free from 17:00 till 9:00. Between 17:00 and 17:30 it is usually possible to find a parking spot. There is also a public parking at the beginning of the street (24h@7.50). The SW costal path to Zennor is very nice. You can start walking right from the B&B. Lovely hosts and very friendly. Great food! Service and recommendations great as well! A most delightful, welcoming, well located guest house with all the facilities any guest would want. There is nothing that has not been thought of in this guest house, but most importantly, the warm, welcoming reception by Anthony and his wife Tim is priceless. Delicious breakfast too. Looking forward to coming back soon. Although we were only there for one day/evening, there is a lot to see including the Tate Gallery. A visit to the Seafood Cafe for fresh seafood is a must. Loved our stay at Little Leaf. Our hosts were fabulous, so friendly and welcoming. The breakfasts are amazing! The Daily specials are a great idea and the French toast is a must!! Can't wait to return. Very welcoming hosts. Delicious breakfasts and loved the choice of daily special as an alternative. Perfect. Lovely breakfast, very friendly and helpful hosts, great view, comfortable rooms. Could not fault a thing. Antony and Tim were superb hosts. Antony helped us plan our days in St. Ives with lots of excellent suggestions and both were so friendly. 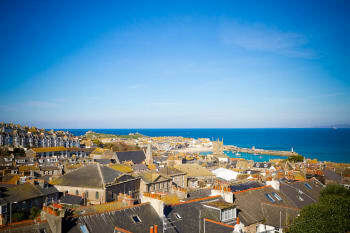 The B&B has stunning views over St. Ives and is a few minutes walk from the centre of town. The property is up on a hill but Antony explained that even though the main route involved lots of steps, there is a much less rigorous route up to the B&B. 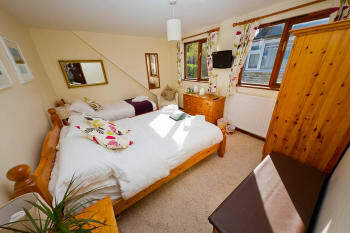 The property was a lovely terraced house and our room was very homely. 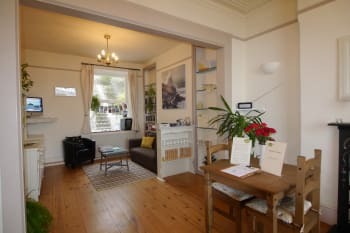 There is an imac with a huge screen in the living room with access to the internet and lots of leaflets/travel suggestions to help you plan your stay. I've saved the best til last - the breakfasts! Tim cooks a mean fry up but there is a 'special' on the menu every day, which are so so good! This is the place to stay if you visit St. Ives. All the restaurants and bars in St. Ives are within a 10 minute walk but we'd definitely recommend making reservations at those you really want to eat at. The Minack Theatre in Porthcurno is breathtaking, Mousehole is a beautiful little village and St. Michael's Mount is a must! What a gem of a B&B. A big thank you to Anthony & Tim for a truly wonderful stay. Whilst we may not have been in the biggest room in the house, the comfort and cleanliness were second to none. Must also mention the lovely choices at breakfast with daily specials on offer alongside fresh fruit salad, cereals, fruit juice and toast. For anyone staying the waffles are a must. The quality of all the products used was amazing and the Full English was enormous!!! Nothing was too much trouble and our hosts were happy to accommodate when we wanted to leave early to start our trip back, they even made sure we had a good breakfast before we left. Thanks again for a great stay to you both, we will definitely be back and recommend you to friends and family, it will be our pleasure. Even if you aren't a fan of the artwork, visit the Tate - St Ives and go upstairs to the coffee shop the views are amazing. Take in the Barbara Hepworth Museum & garden, an oasis in the centre of town. Try a meal at Olives Café on The Island, lovely café in the day and bistro type menu in the evenings with local produce. Walk the coastal path to Zennor and take a pint at The Tinners, or a gentle stroll to Carbis Bay. Great place to stay -- comfort, food, hosts were all excellent. They had exactly what one would want in a B&B. Hosts were always accessible, gracious, and gave helpful information and great recommendations. Our family of four liked the breakfast choices especially the availability of a daily special aside from the regular choices. The coffee was very good. Would definitely stay there again and highly recommend it. Definitely eat at the Porthminster Beach Cafe. Probably one of the best meals we've had, ever. The Monkfish Curry was the best curry I've had (and we've lived and travelled in South Asia and East Asia!). The Coastal Walk to or from Zonnor (or in between) is spectacular. We did half and started in Treveal. Litte Leaf Guesthouse is a charming place in St Ives, and pretty central. Antony and Tim were wonderful hosts and very very helpful with everything. I am glad I chose to stay there and would highly recommend it. Walk the South West Coast Path and enjoy great Landscapes and wonderful nature. Antony and Tim were excellent 'mine hosts' and it was a joy to get to know them and their young daughter during our stay. Their approach was one of attention to detail throughout, but also relaxed in chatting to us and fellow guests. They helped greatly in terms of directions, places to go and places to eat. Attention to detail was their speciality! Breakfasts at Little Leaf were outstanding! In St Ives (where we were based) Spinnaches, half up a stair on the seafront, was exceptional, even though vegetarian. The Black Rock Bistro nearby we can also recommend. Always ask for Cornish Beer as there are so many to choose from and all are at the top end of quality. We went to St Michel's Mount, the St Ives Tate and Barbara Hepworth Museum (the latter on one combined ticket) then further afield to the Eden Project, and en route via Castle Drogo in Devon (just off the A30) where we mixed full-on engineering/building with antiquities in the main house and gardens which I will copy for my own at home. On a smaller scale of course!! Little Leaf Guest House is a Gem. Anthony and his wife are delightful and charming and very kind and welcoming. Nothing was too much trouble for them and they looked after us beautifully. The room was clean and comfortable and pretty and the breakfasts were absolutely delicious. They bake their own bread and we had this for breakfast with homemade jams. Everything was perfect and it was home from home and very special. This B and B is like no other I have ever been to as the welcome was so warm and they were so kind and hospitable. This is a St. Ives Gem and I highly recommend a visit to this imaginative and delightful place. The views over St. Ives from the Bay Window are spectacular. You can sit at the Bay window and look out to sea whilst eating a wonderful breakfast. It's gorgeous!. We went to The Hub for a meal and this was excellent. We had a lobster roll and the lobster had been caught that morning. Good service and friendly staff and excellent food. We loved our stay and have already recommended Little Leaf to friends. Amazing breakfasts, beautifully decorated rooms, and gracious, helpful hosts: thank you, Antony and Tim. Hike the coastal path (to/from Zennor and Lenant), visit St. Michael castle (short bus ride), spend time on each of the 3 beaches in St. Ives, eat at Spinachio's (vegetarian) and Moomaid of Zennor (local ice cream on the Wharf). We went for lovely evening meal at Porthmeor Cafe. Amazing food with even better views! Just go for it - St Ives is lovely! Thanks so much for an excellent stay - the room was beautifully bright and clean, and your suggestions for places to go were very helpful. We really enjoyed our short stay at Little Leaf GH from the very beginning: such a warm welcome, the garden room- nicely decorated and comfortable and you truly a have a wonderful little garden just for your own! Breakfast is just perfect!!! Very kind and accommodating hosts, great breakfasts, good advice on what to do and where to eat. Thank you so much. Getting to Little Leaf is a climb, either up 70 steps or more gradually a switchback uphill, but we're in our mid-sixties and had no problems. The house is lovely. Note particularly the arts and crafts coal stove in the breakfast room. St Ives is a great place to build up your legs walking up and down the hills of the town and the surrounding countryside. We enjoyed eating at the Seafood Cafe and the Porthmeor cafe overlooking the beach and watching the sun go down. Both need reservations, but it's enough to walk by the day before or earlier in the day (we didn't have a phone with us). Very warm welcome from Antony & Tim, thank you very much, we got a great holiday at here. Lovely location, lovely room (2), wonderful breakfasts and fantastic hosts. Eat at The Black Rock. Other than that walk round the town, visit The Island, walk the beaches and out to Clodgy Point for a clamber on the rocks. We could not have asked for a more pleasant and friendly proprietor. You gave us local information of the area which allowed us to make the most out stay. Your B&B is a credit to you. Loved the little touches such as daily breakfast specials and good quality toiletries in the ensuites! Will definitely stay again when we return to St Ives. Mimack Theatre,Mutton Cove to see the seals, Mousehole, all well worth a visit. All recommended by Antony. Fantastic stay, very friendly host really couldn't do enough for us. 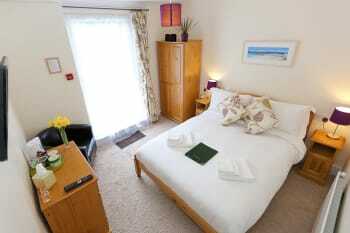 Lovely clean rooms, nice breakfast great location. For lunch and dinner we thoroughly recommend the Cornish Deli. For something a bit more fancy try the Black Rock, awesome food. Lovely people, yummy breakfast, very accommodating, clean and attractive. We had a wonderful stay at the Little Leaf Guest House and look forward to returning. Anthony and his wife were the perfect hosts and we can't thank them enough for making our stay so memorable. The upgrade to Room 2 at no extra charge was not expected! And what a spacious bedroom with a spectacular ocean view (the binoculars was a nice touch) Wish we'd spent more time on the balcony! Stay at the Little Leaf... You'll want to return! The coastal walk to Carbis Bay is a must. Absolutely stunning. Barbara Hepworth Museum (free guide tour) Best fish n chips at The Balancing Eel. Tasty Thai Red Prawn curry at The Porthmeor Cafe (opposite The Tate) Tea, Scones, Cornish clotted cream and jam at the Cornish Deli.